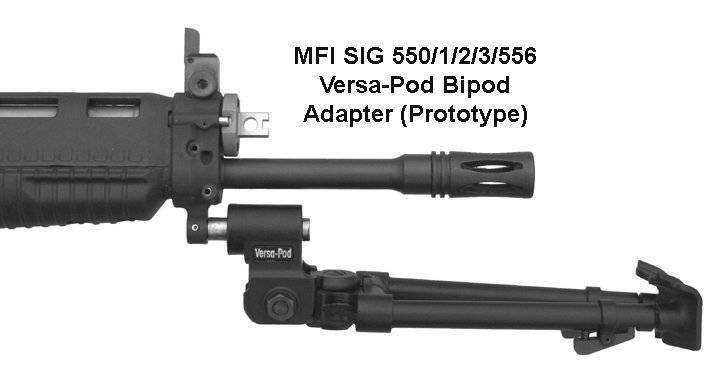 MFI SIG 556 / 550/1/2/3 & 551-A1 Versa-Pod Bipod Adapter for sale. ALL MFI PRODUCTS ARE 100% MADE IN THE USA. MFI Bipod Adapter (1) ONLY to be able to attach a Versa-Pod Bipod to the USA SIG 556 (all models) & SIG 522 (all models with Bayonet Hole in Gas Block)as well as all models of the Swiss SIG SANs 550, 551, 552 & 553. Pictured above in our gallery of extra photos is the original PROTOTYPE Adapter which is uncoated. The production version is all black. 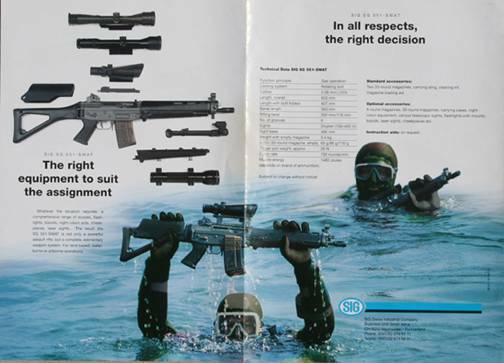 Also pictured above you will see original images from the SIG 551 SWAT brochure that dates from perhaps 1980. As these are so hard to come by we have copied the original SIG Bipod Adapter to be as close as possible to the original. We have deviated from the original in only one regard... Ours is a hair shorter than the original. We did this to reduce the profile and as the added length was not needed. Our length accommodates all models of the SIG 556 and SIG SANS 55X gas blocks so that the bipod does NOT hit the gas block or barrel at any point. The MFI SIG 556 Bipod Adapter will work with ANY Versa-Pod Bipod. The Versa-Pod Bipod we are selling in this set is the same model SIG bought 30+ years ago. The only difference is the feet. Versa-Pod no longer makes the round flat feet so we went with the Ski Style Feet as they perform better in sand and loose rock than the rubber round feet. This Adapter is made of Weapons Grade Steel. Weight: 1.4 oz. / Super Light Weight! Use with ANY Versa-Pod Bipod. Mounts in Bayonet Hole in Gas Block. SPECIAL NOTE: SIG 556 Rifles & 556 Pistols with Quad Rail Hand Guards that use this same hole / socket as a hanger point will NOT be able to mount this product, unless you hand file or grind down the rear of the lug to allow the RIS Hand Guard mounting stud to fit into the same hole at the same time as the lug. This is possible, but requires hand fitting. How to install the roll pin in the Bayonet Lug or Front Sight. 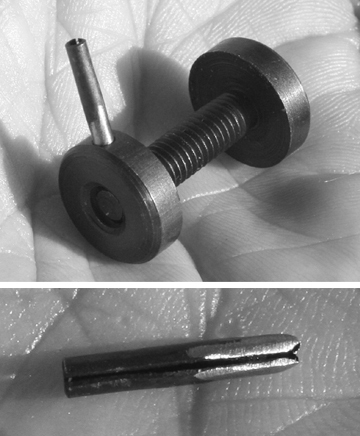 It is easy to mess up the roll pin when you first try to install it. Read below to avoid the pitfalls. There is a first time for everything and that is a part of any weapons system. 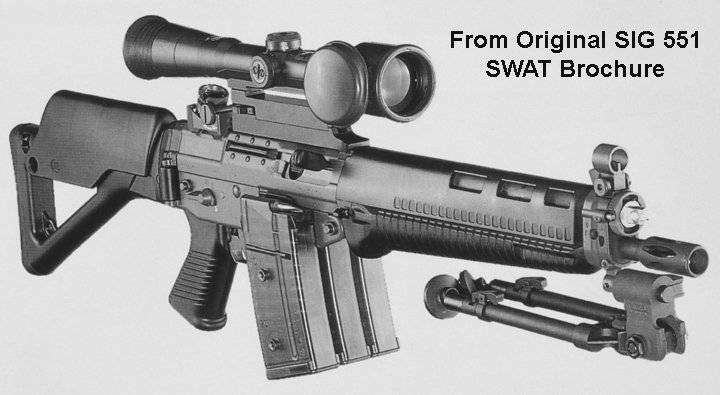 When SIG installs these at the factory they have a special fixture or a second person to hold the weapon. While a fixture or third person is NOT required it sure makes it a lot easier. All you need is someone to hold the weapon while you hold the punch and hammer. It is a lot easier to file or grind down the roll pin at one end and then gently collapse the same end with a vice grips of pliers so that it just fits / sits in the hole. This will free up one hand. This is almost a requirement. 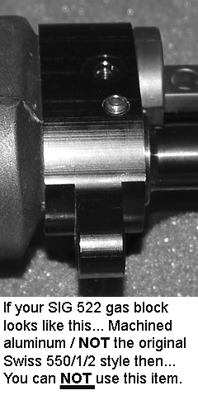 While the photo below shows the roll pin in the front sight the principle is the same for the bayonet lug. For the Bayonet Lug you will want to level and back the lug's mounting point with a block of wood. Roll pins are designed to be hard to drive in and it will require significant force with a hammer and punch. Lubing the roll pin and hole will help getting this done faster. Be sure to look through the hole to guaranty the alignment.